Well, at least didn't have to wait six months to get the taste from yesterday out of our mouths. One of our goals here at Heaven & Helton is to do everything within our power to eliminate the wave from Coors Field. Ultimately we'd like to see it completely removed from all sporting events, but we have to get our own house in order before we can take those bigger steps. To do that we must expose the people at the root of the problem. That's rarely ever a problem. Those people are easily identified by how loud they are, the content of the loud mouth verbiage, or, like yesterday, his girlfriend is wearing a WINNING t-shirt. Secondly, and most importantly, we must have a good, non-violent plan of action. I mean after all, we want YOU to stay in the ballpark. You're a good fan. The clown below is the person we want to drive out of there. I think we saw a great example of the proper way to handle him during yesterday's home opener. Even though the douche in the middle deserves to be punched, seriously, we DO NOT encourage or condone violence as a means to stop the wave. What we do encourage is a reaction similar to the guy in the red hat. Cross your arms and ignore the wave starter. That's it. It can really be that simple. All that toolbox wants is attention. By ignoring him, you are defeating him. By defeating him, we're winning one important battle against the wave. Sure he might move on the next section and try that same trick. That's fine. Defeat him there too. 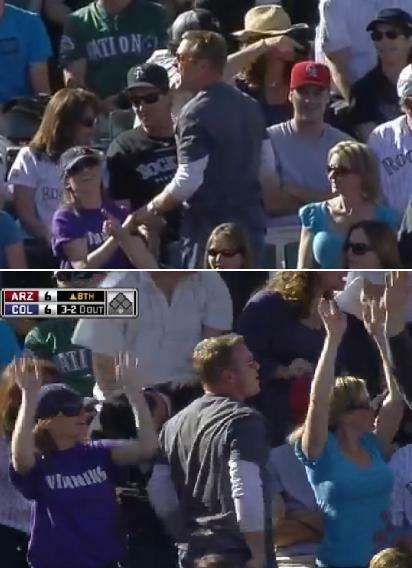 Defeat him in every section until he's too bored and discouraged to ever attend another Rockies game. And then we move on the next one. A partial thanks to ROOT Sports. Because if Opening Day was weighted in the standings the same way fans weigh it in hype and anticipation, the Rockies would be in quite a hole right now. You can read the bulk of my recap of Friday's home opener in this Big League Stew post. -- Jose Lopez was sensational today. Absolutely the best player on the field wearing purple not named Carlos Gonzalez. That doesn't change what I said before about Jonathan Herrera getting the start in the opener. I felt he deserved that nod. Still do. And I'm not ready to anoint Jose Lopez my new favorite Rockie or even my favorite new Rockie. One game (good or bad) can't wipe away the opinions I've formed (right or wrong). However, I'm willing to rethink my position on the duo going forward. For example, if Lopez is going to continue playing defense at that level, well, it's a no brainer. He plays, because your bench is better with Herrera's versatility sitting there. I just need to see more of the entire package of what Lopez provides the 2011 Rockies before I go too far in either direction. If I'm ultimately completely wrong about Lopez, that will be a good thing, because the Rockies will be benefitting from production I wasn't counting on. -- Ubaldo's lack of velocity was terrifying. If we see more of the same his next time out, I'll need to be held. -- I'm not the guy who likes to blame umpires, but those guys were garbage. You're going to screw up. We get that. But you OWE the players, the game and the fans 100% effort on every play. Get your asses in position. Call what you see. 90% of these horrendous missed calls in MLB are out of pure laziness. That's inexcusable. The game will only continue to suffer until an effort is made to clean house and get some new blood out there. That doesn't necessarily mean young guys either, they just need to be guys that are willing to give effort on every play. No different than teams putting together their 25 or 40 man roster. -- Arizona still isn't good. They wanted so badly to give this game away. I will say the back of their bullpen looks much improved with J.J. Putz in the 9th inning, but overall this team just stinks. I have little doubt the Rockies will win the next two if they just stay out of their own way.